If you're old, you might think of the movie, Cool Hand Luke, which starred the late Paul Newman, as a classic. As noir as Horace McCoy's They Shoot Horses, Don't They? But have you ever read the novel by Donn Pearce on which Cool Hand Luke is based? And if you're young, you probably couldn't sit through the entire movie or maybe you have seen it and just didn't much like it. This is from an informal pole I took among younger, educated people. It is certainly not a classic in their estimation. The kind of rebellious, progressive existentialism embraced widely by youth fifty years ago has been replaced with a kind of Ayn Rand materialism. Blue collar individualism marked only by anti-establishmentarianism has turned into an idealism of money, status, and material wealth. Union is a bad word in the mouths of the young. Half of them think that they will one day be CEOs, or at least the upper executives of major corporations. Just ask them. Cool Hand Luke was a nothing, simply another loser, they say. A cog in the endless stream of human debris. He belonged in prison. They don't really think of themselves as individualists--they don't use that word. They think of themselves as winners who simply haven't won yet, temporarily disinherited knights of the free enterprise system. Losers and the lazy philosophies of losers have been holding them back, but a change is in the wind. They have high expectations. 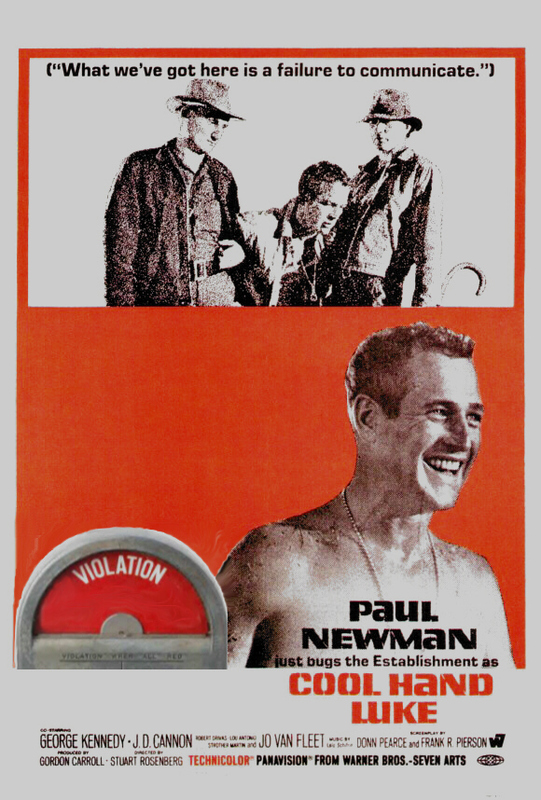 The humanitarian aspects of Cool Hand Luke do not interest them. Their sense of entitlement is coupled with a hatred of losers. I can quote that passage in Dickens' Christmas Carol that begins with "Are there no prisons?" but they don't see any relevant irony. When asked, most say that they are Christians but imply that their religious life and their careers are separate, the way you old liberals think of Church and State. Donn Pearce was serving two years at the Florida State Farm for burglary when he first began serious reading and writing. According to an article in Esquire, Pearce first read William Faulkner after another prisoner angrily abandoned a copy of Faulkner's Sanctuary, for not being pornographic enough. 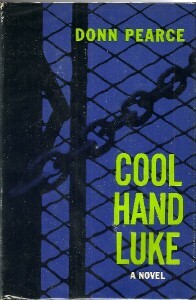 Pearce wrote and rewrote Cool Hand Luke for years. After many rejections, the book was finally published as a Fawcett paperback original. Scribners later picked it up and put it out in hardcover, but only about eleven hundred copies were sold. Today a dejected Pearce, now in his eighties, says that he is the author of four books, counting Cool Hand Luke, "none of which people want to read." Donn Pearce submitted a first draft script for the movie and was given a cameo role, but the other screen writer was the late Frank Pierson. The word "late" appears before the names of more and more of the baby boom generation, as those who hold Cool Hand Luke high in their estimation die off. The last scene of Cool Hand Luke finds him in a church, holding a one-sided conversation with God. He tries to talk with God, but receives no answer--which gives a double irony to his last words, "What we have here is a failure to communicate." That oft-repeated line, as well as "Yeah, well, sometimes nothin' can be a real cool hand" did not come directly from Donn Pearce but was drawn from a scene in the novel. The television drama, NCIS, parodied the church scene with Denozzo talking to God in the same way, but it seems that few people got the reference (link). If they did, they were old. Classics have lasting power. It remains to be seen if Cool Hand Luke, novel and movie, will be remembered decades from now. It doesn't look good. You can read Benjamin Alsup's comprehensive 2005 Esquire article on Donn Pearce at this link. Robin H. Smiley, who edits Firsts: The Book Collector's Magazine, wrote a feature on Cool Hand Luke which appears in the current edition (September, 2012), available at this link. James Pepper's quality first edition store has been trying to sell a first Scribner's hardcover edition of Cool Hand Luke for some time now and has been marking it down. This copy was signed by George Kennedy, picture laid in. Link. The Wikipedia link for Donn Pearce is at this link. Pearce's early adventures are similar to those of the protagonist in B. Traven's The Death Ship. This is an extension of the Friday's Forgotten Book series, one of many, and you can read the other authors and bloggers at this link. I love this book, and I thought about doing it for FFB. Glad to see there's another fan of it. Loved the movie, never read the book. Gotta fix that real soon. Don Pearce passed away July, 2017 in Fort Lauderdale, Florida. Survived by his 3 sons, numerous grandchildren and admirers of his writing. Preceded in death by his devoted wife, Christine.